Mort Kunstler Handsigned & Numbered Limited Edition Print (2006 Snow Scene) : "Sunrise Service "
From the Artist: What a remarkable people they were - that generation of Americans who faced the Civil War. The more I study and paint events from that difficult era, the more I ask myself - "How did they bear it?" And, of course, the answer for so many was their faith. You can't study the soldiers of the Civil War and their families without being impressed by the depth and dedication of their devotion. It really was the heart of that generation. 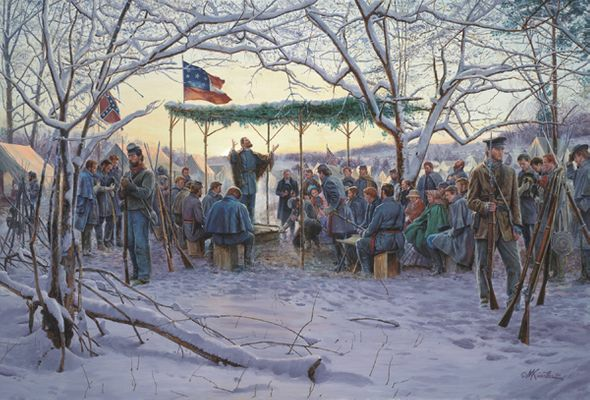 For many years, as I routinely considered subjects for our annual "Snow Print," my good friend Rod Gragg - Civil War historian and author - continued to suggest that I paint a morning worship service. I admit that I feared it would be a boring picture, and dismissed the idea for years. Then I discussed the idea with another good friend - Civil War historian James I. Robertson, Jr. - author of Stonewall Jackson - who supplied me with extensive information on Civil War camp life and worship services. I realized that both my historian friends were right. The potential for a great picture awaited me. The Southern countryside draped by a mantle of snow is, of course, a spectacular setting for any painting - and numerous snowy Sundays are on record during the war. Add to that the gorgeous tones of a winter sunrise - and a memorable stage is set for the painting. I also learned about the very moving personal elements of 19th century outdoor worship services in America - the different characters and poses that would have been seen at such an event. As I made preliminary sketches of the scene, I was able to include many of these elements - such as the typical praying poses of the "hat over heart" and the "crossed arms." My annual snow scenes usually take place in the evening, so it was a nice change to paint an early morning sunrise. The focal point of the painting is the Southern chaplain, and I painted his dark figure against the lightest background. This design element, using the biggest contrast, brings the eye of the viewer right to the chaplain - and immediately tells the story I want to convey. Another design element, using tree branches as pointers, brings the eye to the focal point as well. For color accents, I have shown the South's First National flag and the Southern battle flag - both of which came in use in General Robert E. Lee's Army of Northern Virginia in the winter of 1861-62. During winter camp, some of the officers were visited by their wives, and this gave me the opportunity to include some women and an infant. What has emerged here in Sunrise Service is a wonderful, meaningful painting. It's an artwork that truly expresses the heart of that exceptional generation of 19th century Americans - both Southern and Northern - and I think it's also one of the most attractive pictures that I've ever had the opportunity to paint. Thank you, Rod and "Bud." Without your suggestions and input, Sunrise Service would not have come to be - and I'm so glad to have painted it.